The world’s largest rubber duck arrived in Toronto a couple days ago and will be here until tomorrow. 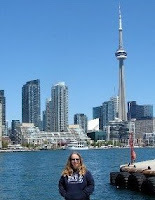 I walked down to HTO Park (near Queens Quay and Rees Street) this afternoon to check it out. The duck is very popular! After tomorrow, it will head to to Owen Sound, Sault Ste. Marie and Midland. When I see the duck I think why? My mom is from Owen sound and I still have family there😀Safe travels.